Connect Dynatrace NAM with Dynatrace to get seamless visibility into all of your applications and service network activity, without touching your servers. By integrating NAM insights with Dynatrace, you get complete network visibility alongside the deep code- and process-level metrics you already receive from your Dynatrace OneAgent-instrumented hosts. Dynatrace NAM complements Dynatrace OneAgent-monitored environments by providing network, web, and non-web application performance visibility into all servers running inside your data centers. By combining Dynatrace NAM monitoring capabilities with Dynatrace, you get full data center visibility out of the box, automatic detection of performance and availability issues, and automatic alerts to hot spots where it’s recommended that you install OneAgent to get additional process-level visibility. The NAM Probe monitors all servers that receive traffic within your data centers. This includes all the servers where you’ve installed OneAgent for full-stack visibility. Both NAM Probe and OneAgent identify servers using the same IP address and port numbers. The NAM Server sends preprocessed monitoring data to your Dynatrace environment where the Dynatrace Smartscape topology mapping algorithm correlates the data at the process level. NAM (DC RUM) 2017 Service Pack 5 or later. NAM Software services for your applications set up in NAM. Enablement of NAM Server connectivity to your Dynatrace SaaS/Managed instance. The NAM Server needs to connect to a Dynatrace Managed or SaaS environment URL on port 443. Deployment of OneAgent on each mission-critical host on which you’ve defined your NAM Software services (for full-stack visibility and to complete your Smartscape topology map). Dynatrace SaaS/Managed discover these candidates automatically and guides you through OneAgent deployment. Permission to sign into both the NAM and Dynatrace SaaS/Managed as an environment administrator. It&apos;s recommended that you configure 1 minute reporting intervals in your NAM environment before sending data to Dynatrace. NAM setup is straightforward. In short, you begin by adding your Dynatrace Managed cluster or SaaS environment as a new device in the NAM Console and then assign the device as a data stream to NAM Server. Once you save the configuration, NAM Server immediately begins sending monitoring data to your Dynatrace environment. Add your Dynatrace Managed cluster or SaaS environment to your NAM Console. In the NAM Console, add Dynatrace as one of the devices. For full details, see Add device. 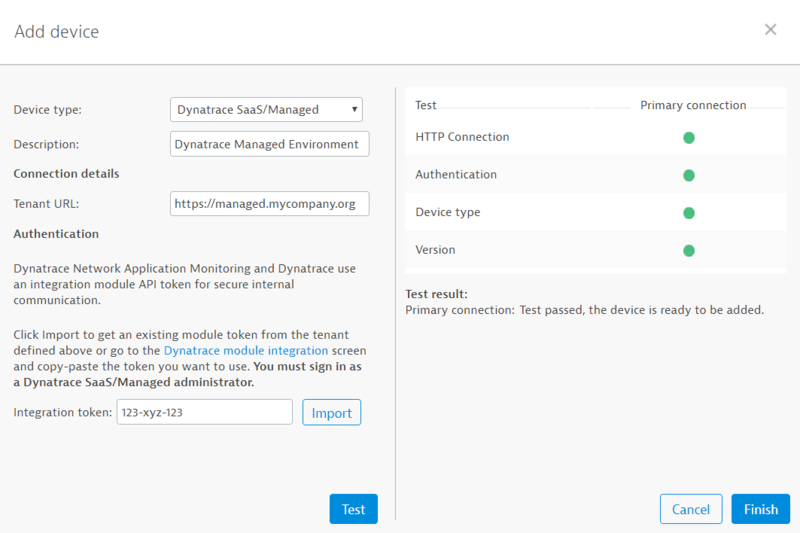 You need to provide the URL and the automatically generated integration token to authorize the connection between NAM Server and Dynatrace. You can copy/paste the token or import it automatically. In either case, you need to be able to sign in as a Dynatrace SaaS/Managed environment administrator. Identify the added device as the NAM Server data stream. For details, see Data sources and destinations. Configure NAM Server data export. Dynatrace lets you further analyze your data center issues by providing context drilldown links to NAM Server. By default, the link is built based on the NAM Server IP address or hostname used by NAM Console for the device management. If it&apos;s an internal address, accessible only from within your private network, you may want to replace it with a public NAM Server URL for the Dynatrace users outside your network. Expand the Advanced configuration section and add the public NAM Server URL as the Drilldown URL. You can also add a URL pointing to your NAM Server failover, if you&apos;ve set one up. NAM monitoring information now automatically appears within your Dynatrace environment. You can analyze NAM monitoring data in Dynatrace from various perspectives, starting both from Dynatrace, and NAM. From the Dynatrace navigation menu, select Applications. Here you will find all monitored applications, both Dynatrace OneAgent-monitored applications (listed under Web applications and Mobile applications) as well as NAM monitored applications (listed under Enterprise applications). Enterprise applications for each user-defined software service are displayed automatically. Click Details an Enterpise application to drilldown to NAM. All NAM software services that are supported by NAM Server data export appear in the Data Center Services list. Click these services to view individual Data center service pages. If both, NAM and Dynatrace monitor the same host, you can analyze drill down directly from the Host page to NAM Network explorer providing extended network performance statistics for the host. Both Enterprise applications and Data center services are integrated into your Dynatrace topology and visualized in Smartscape. If OneAgent is running on a server that hosts a given software service and application, Smartscape will include the related processes and host infrastructure metrics, including all log analysis capabilities. If you&apos;re working in NAM, you can alternatively begin your analysis from the Software Service column in one of the NAM Server Explorer reports. This takes you directly to the Dashboard or Smartscape. Note that a link is available only for those services that are exported to Dynatrace SaaS/Managed. Current Dynatrace versions require DC RUM 2017 Service Pack 5 or newer. Starting with NAM 2018, the single sign-on functionality between NAM and Dynatrace is available if you use the same external SSO provider for both NAM and Dynatrace. You can send data from multiple NAM Servers to a single Dynatrace environment or cluster. To do this, ensure that the NAM servers don’t overlap in their service reporting because the Dynatrace SaaS/Managed isn’t capable of deduplicating the data. Dynatrace SaaS/Managed currently only reports aggregate user metrics. There&apos;s currently no visibility into real user experience or user-action performance . Although it&apos;s technically possible to export data from one NAM Server to multiple Dynatrace SaaS/Managed instances, we recommend that you add only a single data destination to the NAM Server.